About 5 years ago I started developing a lump on my leg – on my thigh. It grew to the size of a small marble. It was below the surface of the skin and seemed fairly firm and quite spherical. Lumps growing under your skin can be bad news so I went to see my doctor. He told me it was a lipoma – a harmless build up of fat under the skin. He said I could have it removed if I wanted to but that it would do no harm if I left it. I lived with this odd lump for 5 years and it didn’t cause me any trouble. A year ago I spotted that it had grown larger. It had now reached the size of a large marble under my skin. I went back to the doctor and this time we decided to get it removed. He wrote me a referral and told me that I should expect an appointment letter from the St. Mary’s hospital in about 6 weeks. My appointment letter arrived. It told me that I would be a day patient – i.e. no need for an overnight stay – and that the surgery would be carried out under local anaesthetic. I was told the date and time to report to the small surgery unit. Apart from that there were no special instructions. On the day I reported to the St. Mary’s Hospital small surgery unit’s reception and had a simple form to fill in. A little later a nurse came in and told me to change into the hospital robes. I did this and waited some more. Another nurse arrived and took me upstairs to another waiting area. This waiting area was full of other people in surgical robes – either waiting for their surgery to begin, or sitting there under observation after their surgery was complete. More waiting was involved, until the surgeon appeared and lead me to another room. This room was like a doctor’s room. It had a movable bed (plastic, not fabric covered), and lots of cupboards. Another nurse was in the room as well preparing some equipment. The surgeon asked some questions and took a look at my lump. She explained what she was going to do. Seemed simple enough, give me the aesthetic, cut a slit in the leg, remove the lipoma and then stitch the leg back up. I had to sign a form saying that I understood what was going to happen and that I understood that I would be left with a scar. She had me lie on the bed and positioned my leg. She shaved the area and then using a marker pen drew a few lines onto the lump where she was going to cut. She then swabbed some liquid (I’m guessing it was iodine) onto the area to sterilise it. Next was the anaesthetic. I had assumed that this would involve a single injection to the area – wrong! She told me that the injections were usually the worst bit of the surgery. She would inject into the surrounding area multiple times. She warned that the injections would feel like bee stings. The injections did definitely sting. She started out with about 4-5 injections around where the lump was. She then poked the area and asked if I could feel anything. I could. She then gave me another 4-5 injections – I wasn’t watching but I think that as well as them being around the lump they were also at different depths into the skin. Clearly each injection only numbs a very small area. More injections followed until finally she was satisfied that the area of my leg would not feel anything. As I was lying down I fortunately couldn’t see exactly what she was doing. I saw her holding a scalpel blade. I don’t know exactly when she started cutting into my leg. This is obviously a good thing and meant that the injections were working! She spent some time doing what I assume was cutting. It is a very odd feeling to be lying down whilst someone uses a scalpel and surgical scissors to cut into your skin. 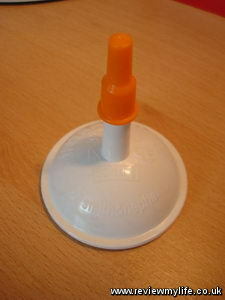 Every so often she’d ask the nurse for some help of a new piece of equipment. A few times she needed a new scalpel. After what was about 10 minutes she told me that she could see the lump and said that it wasn’t actually a lipoma which is what my doctor had diagnosed it as. It was a harmless benign cyst. The surgeon said that this made it a bit more tricky as she needed to remove it in one piece. If she couldn’t get it out intact then there was a risk that a piece could get left behind which would start growing again. She also told me that it was quite firmly attached at the bottom so it would require a lot of cutting to remove. She continued cutting and snipping for another 15 minutes. I didn’t feel any of it. All I could feel from my leg was a numb feeling caused by the anaesthetic. Similar to the numb feeling you might get from a dentist anaesthetic. Finally she announced that it had been removed! She checked that there were no pieces left and then got ready to sew me back up. Doing the stitches (or sutures as medical people call them) seemed to be straightforward. She used 6 stitches in the area. She told me that they usually have the ends cut short but in my case she’d leave them long so they didn’t come undone. There was a risk as the incision was in a mobile part of my leg. On top of the main stitches she stuck some paper stitches down – so the main stitches wouldn’t move about. I had a look at the wound at this point and the sight was not great. 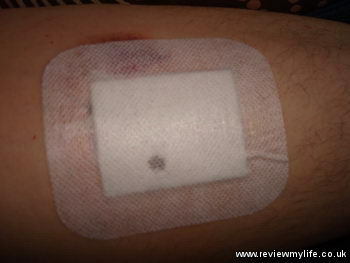 It was as if someone had cut a one inch hole into my leg and then sewn it back up – which of course is what had happened. She then put a giant plaster over the stitches and finally wrapped a bandage tightly round my leg. She told me that I should take it easy today, and warned that my leg could be very painful once the anaesthetic wore off. I could take some standard pain killers if I needed them. I was to take it easy for the next few weeks but there was no need for me to avoid walking. No running, sports or anything stressful for my leg, but normal walking would be fine. In two weeks I should go to a nurse at my doctor’s practice to get the stitches removed. I was also told not to get the wound wet. I could shower if I kept my leg away from the water, but definitely no baths. It all sounded like it had gone very smoothly. Little did I know that the surgery was only the start! Before I left the operating room she showed me the cyst in a bottle. It was white, quite spherical and the size of a large marble. It looked a bit like an eyeball! After the surgery I was told to sit down in the waiting area and have a drink and a biscuit. 10 minutes later I was allowed to leave. It was quickly apparent that walking with an anaesthetised, stitched up leg was to be a slow affair. I made it to be bus and managed to get home. Once home I sat with my leg up and tried to rest it as much as I could manage. For several hours the area of my leg that had been operated on remained very numb. Slowly the numbness started wearing off, to be replaced with a sharp painful stinging sensation. I’d been told that I could take painkillers if I needed them. The problem is that you don’t know how much the pain is going to increase by. I decided not to take any pain killers unless the pain got really bad. For another few hours the anaesthetic wore off. The pain did increase but it was manageable. It was most noticeable when trying to move or walk. I had to sleep on my back that night as my leg was too painful (and too fragile given that it had new stitches in it) for me to put any pressure on that leg. The next morning the pain had died down considerably. I was able to hobble around, but my limp was obvious. I continued to rest my leg as much as possible as I knew that I needed to give my wound a chance to heal. Over the next two weeks the pain reduced more. I was able to take the bandage off in the first week but the large plaster remained covering my wound. I had no idea what was happening underneath, but I was hoping that the hole was closing up. It was no longer painful when sitting or walking, but the pain was there if any pressure was applied to the area. I still couldn’t sleep on my side. As the days wore on I could walk more and more normally. I thought it must be getting better. Two weeks after my surgery I visited the nurse to have the stitches removed. I couldn’t visit the nurse at my doctor’s practice as they were dealing with a mice infestation, so I went to the Soho Walk-In Centre. You don’t need an appointment to go here, but you do have to be prepared to wait. On this visit I arrived after work and after filling in the form they gave me, I had to wait nearly two hours before I was seen. The nurse was very friendly and after questioning me asked me to sit on the bed. First she removed the giant plaster and then started removing the paper stitches. I was watching as she did this. The paper stitches are stuck onto the skin (like match stick wide pieces of masking tape). The adhesion is fairly strong so a bit of ‘pull’ is needed to remove them. As she took them off it became very obvious that my wound was still completely open. Only the main stitches were holding each side of my skin together. She spotted that one of the longs ends of one of the stitches was sticking inside my leg. Perhaps this was making it harder for the wound to heal. She re-positioned the end part of the stitch and told me that it was clearly too early for the stitches to be taken out. She put some new paper stitches in place, and put another giant plaster over the wound. She told me to come back in a week. Before I left I did find out that in order to avoid a two hour wait it would be a good idea to get there just before 8am when it opened. A week later I went back to the Soho Walk-In Centre. As suggested I got there before 8am. There were already a few people waiting. At 8am the door was opened and we were let in. I filled in the form and after about 10 minutes was collected by another nurse. She removed the giant plaster, and then the paper stitches. The wound looked pretty similar to a week ago. It still wasn’t closing up. The nurse told me that she would have to remove the stitches anyway. She said that there was a limit to how long they could be left in. She removed the stitches – which is very quick and painless by the way – and then cleaned up the wound. She put new paper stitches on to try to hold the two edges of skin together and then put another giant plaster over the top. She gave me some giant plasters so I could replace the plaster a few times and told me to come back a week later. Over the next two weeks I visited the Soho Walk-In Centre three more times. 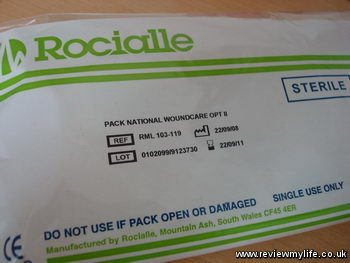 Each time my wound would be examined, cleaned and be re-dressed. 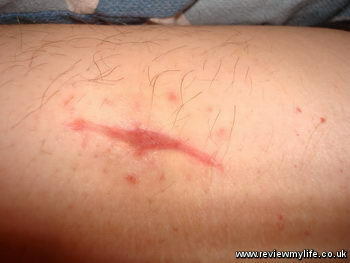 Each time when I saw the wound again it didn’t appear to be much better. Each time I was told to come back in 3-5 days. One one occasion to save me a visit one of the nurses gave me a dressing kit so that I could re-dress the wound myself the next time. 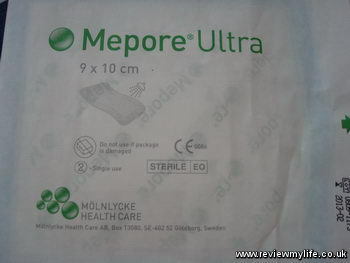 And I was given a supply of the Mepore giant plasters so I could change them every few days. On another of the visits a gel was squeezed into the wound which was supposed to encourage the healing process. It was now four weeks since my surgery and the wound was still not closing. I was wondering if the wound could be infected. In fact one of the nurses had wondered this but after getting a second opinion had decided it wasn’t. On visit number 6 to the Walk-In Centre the nurse I saw told me she believed the wound was infected. She explained that this was why it wasn’t healing up. She cleaned and re-dressed the wound. Over the actual wound she put an inadine sheet. This is a small piece of fabric which is soaked in iodine. 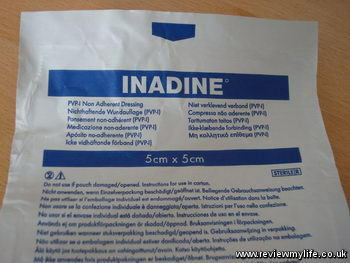 Iodine helps to kill bacteria. She also gave me a prescription for Flucloxacillin – an anti-biotic which is similar to penicillin. I was to take this three times a day for the next week. The Flucloxacillin caused me no problems apart from one day when I had a lot of chest tightness. On my 7th visit to the nurse I mentioned this side-effect but was just told to keep taking it. On my 8th visit I saw real improvement to the wound. It looked like the anti-biotic had killed the infection and allowed my wound to heal. The wound had almost closed up. 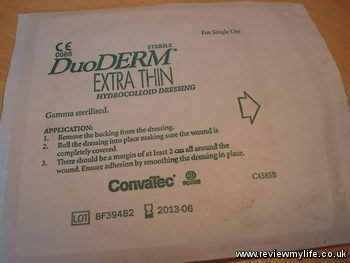 Rather than putting a giant plaster over the wound the nurse put a thin see-though skin-like layer over the top of it. She said this would help the scab that was over the wound to break down and would speed up the healing process. Six weeks after my surgery I made my 9th visit to the Soho Walk-In Centre. My wound was now fully closed up. 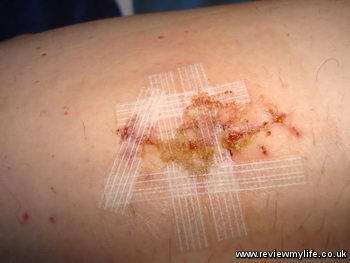 The nurse took off the skin-like layer, cleaned the wound and put another one of the skin-like layers over the top. She told me to leave this layer on for another week. She told me that there should be no need to come back! Indeed this was my last visit to the nurse, after taking the final skin-like layer off I was able to leave the wound exposed. It still had a large scar over the area, and there was a indent where the cyst had been but at least I could have normal baths, and showers again. Over the next 6 months the scar did reduce. It still hasn’t disappeared and the indentation is still there but it is good to have got rid of the lump – even though the whole experience was a lot more hassle than it should have been. This entry was posted on Monday, August 3rd, 2009 at 7:49 am and is filed under Life, Top Posts. You can follow any responses to this entry through the RSS 2.0 feed. You can leave a response, or trackback from your own site. I have a similar bump under my skin. It is on my fore arm and I am thinking about getting it removed. The doctor told me it was lipoma but my family physician said it could be cyst. I am holding off as the doctor wants $350 + cost for local anaesthetic. She said if it cancerous then the Government will pay for it. I thought as Canadians we were covered. Anyways, I don’t want to spend the money yet and will probably get it done over the winter. Nice post! I am getting a cyst removed this monday on my left shoulder. I’ve had it drained 3 x’s and it came back again. I showed the surgeon that drained it last time and he said that it needed to get cut out. This time it isn’t infected or very large so hopefully it won’t be painful when it is removed. Thanks! Hmm, well I had mine removed 3 weeks ago. It was about the size of a kidney and directly in the middle of my back, just where my bra strap crosses horisontally. I’ve started the self medicate on antibiotics which I got for a rout canal, as I am quite worried about the wound. Stitches are supposed to disolve now, but there is no evidence that it is happening. Also I don’t think the wound is healed well enough for stitches to come out. It took them 1 hr and 15 min. to cut it out of my back, directly on my spine. I also keep having this pain to the left of the wound and it feels like the whole area now contains a smaller lipoma that could fall out if I move to much. The area underneath and around the stitches does not seem to heal well from the inside out. God help me, I just pray it heals quickly. For you folks still waiting a similar procedure, I’d suggest take time out from work and plan a month long holiday to watch television and read at home! I have a lipoma on the right side of my waist, its about the size of a cricket ball. I found the lump eight years ago when it was diagnosed as a lipoma by my GP. 8 weeks ago the GP looked again and said it was fine, although huge in size. Two weeks after another GP sent me to a cancer specialist as a precaution, it was ultra sounde and found (thank God ) to be benign. I am now awaiting removal by surgery………………….mainly due to the size and location, its very noticable and irritating if wrong waistband worn……..so awaiting surgery…will update after. I was diagnosed with a Lipoma a few weeks back, which is located over the back of my shoulder which has been growing at a slow pace for the last 3 years but over the last year has been quite painful…………orignally i had believed it was a muscle tear from injury, but decided at the beginning of the year to investigate due to the pain and size, as it about the size of a tennis ball. It was only confirmed after having an MRI Scan………….so will be attending back at the hospital next week to book in for a surgey appointment…….due to size and pain that it causes………….. I just had one taken out of my thigh in Spain. The stitches came out in 2 steps. 10 days and 14 days. It looked the same as yours. I healed fatser. I am flad I did it because these things grow and can be comlplex, so I recommend taking them out if you have insurance or can afford it. My doctor had much difficulty removing it, I just hope he got it all, as if it comes back, I can’t go through this all again. I had one removed from my thigh a few years ago. I have a number of them on both thighs, but this one was so large that it showed through my pants leg. The doctor showed it to me after it was out and it was almost the size of a golf ball. But the wound was quite deep. The sides did not meet and as it healed, it left a deep “crevice” in my thigh. It is quite noticeable and I ran out of creative explanations for it – “That’s where the bear clawed me.” “Got that in a bar fight.” But at least it doesn’t show through my pants leg. I had a lipoma removed Sept 4 2009. I had it done at a private clinic as it is not covered by medical here in BC Canada. The lipoma took 10 years to grow from aprox 2 cc to around a small hand full–maybe 5oz by volume … directly over my right S.I. joint on my lower back. It was at the site of chronic pain which they (Doctors) say is a coincidence. Other practioners (chiro, massage) said having a big lump like that right over the joint could possibly interfere with free movement and lead to pain. I think it makes a difference having it gone. I am healing quite well but would have liked more post op info. I paid $900 for removal by a cosmetic surgeon. He explained the procedure very throughly…did extra work with three layers of stitches to ensure no crevice. I had 2 large lipoma removed from my forearm today in London at the Ealing Hospital (no cost as it was done on the NHS). My external stitches were proper stitches unlike your paper stitches plus I was told to remove the bandage on day 2 and allow the wounds to heal exposed to air (though I have been give an antibiotic cream to apply each day to stop the wound drying out). I am a chicken when it comes to pain – but the initial injections were ok.
Had this lump on the back of my neck for decades. Started out as a minor mass then recently had grown to the size of a small golf ball. At first I thought it was a limpoma so I tried reducing it with green clay applications combined with Tea Tree oil. That did not do much. I decided finally to seek out a surgical solution. The Syrian doctor that operated was very good. The hardest part was the anesthetic injections. They felt like bee stings. Turns out it was a cyst. As I write this message I am about 50 hours post surgery and have started removing the bandage in the daytime to air out the incision. 4 stitches inside to avoid crevasing and six outside. Very nicely done. Should have done it long ago. I have multipal lipomas. Several on both thighs and 4 small ones on my back. Although they are unsightly, they do not cause pain. Wondering if you can remove several at one time? Does lipo work or must they be cut out for best results? With the exception of the infection – I had a similiar procedure. You described it quite well. I wish I would have read the post prior to my surgery. I have a very large lipoma on my left leg and I am going in tomorrow to have removed. After reading your story and I am really scared now and I hope all goes well tomorrow. I have put it off for over 15 years and it has grown bigger and bigger and bigger. Good luck! How did the surgery go? i have the same bump on my wrist. my doctor says it’s a cyst and that i should get it removed cause it hurts. i’m going to call the hand surgeon to set up something. but there is a problem! my cyst is partly under a vein and right next to another one. i’ve never had surgery before and am kinda scared! Under a vein? wow. i actually work in surgery and have removed many cysts and lipomas. The tricky thing with cysts is that you can’t mearly dain them, but also have to remove the “capsule”, which is thin fibrous tissue that forms the outer wal of the cyst. in a way, a bit easier that a lipoma removal because you don’t always know if you are moving enough fat (which is what a lipoma is). it is interesting that your cyst is under a vein. if you are dealing with a hand surgeon, you are in good hands. I only have experience in general surgery, and their training is much more extensive. infact, in teaching hospitals that I am familar with, it’s the first year residents who get “stuck” having to do minor procedures like removing cysts and lipoma. they are both minor procedures and not much to worry about Jean. if the incision site looks very redish and not closing when you go for a followup, you should be getting antibiotics, in my opinion. I have on on my back and I think on is forming on my left forearm. I am scared. Should I be? Lipomas and cysts are often perfectly harmless. However you should still see your doctor to get it checked out. Particularly as you say that one is growing. Always see your doctor about any growing or new lumps. Hello Im Kaden And Im 19 Years Old… I Have 7 of these all in different places the biggest is on my abdomen the size of a large marble…. im embarassed to even take my shirt off at the beach.. how much would it cost to get them removed??? I have lot of lypomos in my body (around 30). On my shoulder one big lypoma is there and it’s not painful. 3 yrs back , I Contacted a doctor. He suggested me to don’t remove it. There may be side effects , if I remove the lypoma. Because there may be damage to small nurves , when they do surgery. Now the lypoma size is increasing day by day. I want to remove this. Pls suggest me , which specialized doctor I need to contact and what are the good hospital in hyderabad. I have had several lipoma cysts removed in my arms and have many more popping up that need removed because they are big and painful. I have had no problems with the surgery to remove them. I was put to sleep for both surgeries. They did not leave me awake for any of it. I would have wished to be awake but had no trouble any way. Go for it! If it hurts, and is big and disruptive get it removed with no fear! I am due for surgery on a lipoma close to and along side my left shoulder blade. It is about the size of an egg and was found by a physiotherapist. It moves up and down and side to side when pushed. It causes my back to ache sometimes like a dragging feelind and the area it covers feels sort of numb. Three months ago I had surgery to my left shoulder to re attach muscles and file some bone away between the shoulder joint. I have recovered well from this and am nearing the end of physio but I am concerned that the limpoma might be attached to nerves or muscles which might be damage during it’s removal. Also how long it will be before I’m able to drive. My doctor stressed that the removal was going to hurt a lot and that I would be left with a large scar. None of this bothers me but not being able to drive does! as my observation regarding this story.. when you have a small or a big surgery.. automatically as far as im concern, you need to drink an antibiotic, to fast healing the wound together with the pain reliever, you dont have to wait to feel the pain and weeks and months to drink antibiotic…antibiotic is a big help to any infections and viruses. I just came from my doctor where I showed him a large bump that has been growing on my thigh. He says it is possibly a cyst or a lipoma. It is now the size of a half dollar and is interfering with my activities. When I push on it is feels hard and not really movable. It also hits a nerve which makes my leg go numb. When I see a surgeon for this do I ask for a biopsy of the lump? I have never had anything like this before and am scared because I also developed Lupus 4 years ago. Maybe this is a effect of lupus. Hi Stacey, Cysts and lipomas are usually fairly easy to remove if they are just under the skin, so it probably isn’t anything to worry about. Mine was on my thigh too, and they did the surgery with local anaesthetic. It is worth asking the surgeon if a biopsy is necessary. In my case they tested the lump after they had removed it, but it was nothing harmful. Good luck! I am using a Thai balm based on Bariena Lunulina to remove my lipoma. It takes a bit of time but the lipoma is going ! hey this was a big help i have a date for the 16th to have mine removed but its on the left side of my back so hope it wont take 6 week’s to heal. I have had a lipoma since I was 12, I am 27 now. I have been checking it with the doctors regularly, all of them said to leave it. Now it grew a lot, It is very sore and inflamed. My GP told me that it is a sebaceous cyst and it is to be removed like a spot ????. I am very scared, I dont know why he is not referring me to the surgeon! What should I do? Hi Anna, you should really talk to your GP about this. Or if you can’t get good answers from him you should see another GP. Some GPs will do minor surgery themselves so maybe he is thinking of removing it himself. My GP wanted to get another GP at the same practice to remove my lipoma (which was actually a cyst) but when the other GP looked at it he thought it was too large to be done at the doctor’s practice which is when I was referred to the hospital. Good luck! Thank you for your reply. I am really concerned why is it that everyone actually doesn’t take it seriously!! Now I am taking Flucloxacillin for the inflamation/infection and am really tempted to go and do this privately. I live in UK and that is why my GP doesn’t want to refer me to the surgeon, as ‘this is cosmetic’ so doesn’t apply for the NHS. This is the 6th day treatment of antibiotic and doesn’t help. It is very sore and smells horrible. Although it is not opened I am embarassed when at work and keep spraying perfumes…oh God. I hope you all guys will never have this again on your bodies! I was reading all of the above and it left me somewhat scared. 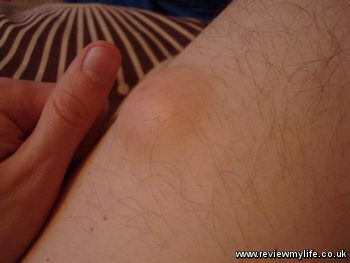 I have this lump almost as big as a quarter close to the inside of my right thigh. I have a question, my doctor, about a year ago, thought it was nothing to worry about, so I haven’t had it checked out anymore, but was wondering if I may have a lipoma. It seems to be just under the skin and it’s quite firm. It is constantly on my mind day in and day out. Did anyone’s lipoma seem to swell all around? When I wear stretchy pants it looks like a have a fat roll on my leg. It’s really embarassing and I don’t like the feeling when my 2 year old sits on my leg as it gives off a funny sensation. Also someone mentioned their leg was going numb. Well my leg is also. I’m just very nervous and would like some opinions. Def. making another Dr’s appt.. I discovered yesterday that I had a lump just under my hair line. At first this freaked me out because I suffer from migranes. lumps and migraine are both symtoms of cancer but my mom looked at it (shes a nurse) and said she thought it was a lipoma. So Im going to get it checked out. She also said that lipomas are usally caused by high cholesterol so if you have lots you may want to get that checked out to stop more forming. Oh, forgot to mention that here in Italy lipoma removal is covered by national health. My co-pay for the pre-op visit, surgery, and removal of stitches (3 visits) was 32 euros (my plug for national health, and yes, I’m an American). Also, lipomas are not caused by high cholesterol, mine, as a vegan is exceptionally low. In fact, there is no known reason for lipoma formation although they do tend to occur more frequently after a certain age, especially in women. When I went to my M.D., somewhat freaked out by this odd growth he just laughed and said, “Mary, it’s a gift of old age” (I’m 60)…Ciao tutti and don’t fret about the surgery…The 5 or 6 anesthetic shots aren’t all that painful either. My surgeon sprayed a numbing agent on my neck before the shots and I hardly felt a thing…Ciao tutti…..
hi, i have two lipomas on my leg. one is on the thigh and the other is on my right buttock. the problem is that they are pretty large around the size of cricket ball and the one on my buttock is even bigger. besides the fact that they are obvious if i wear tighter pants, the one on my buttocks even irritates me when i sit on it. Hi Emma. Your lipomas sound very big – I wouldn’t want to have lumps that large in my body, but obviously you have to decide what to do about it yourself. It is now nearly two years since I had the surgery and I still have the indentation and small scar. But as it is on my upper thigh it doesn’t bother me. It isn’t visible to anyone in public. It shouldn’t have taken so long for mine to heal – the problem in my case is that the wound got infected which is always a risk with any surgery. Maybe you should talk to your doctor, or the surgeon who will operate if you are worried about any indentations after the surgery. If is inevitable that if there is a lump in your body, once it is removed there will be a space where it used to be. I don’t know whether it is possible to do anything about the indentation – only the surgeon could give proper advice about this. Good luck! Get those lipomos taken out. larger they get the more they may start hurting muscles and nerves. I had two taken out 2 days ago. already moving my arm without alot of pain. one was getting about size of softball on my shoulder and alot of it was deep inside that is was pushing on my arm muscles and causing pain. Glad they are out. Surgery was easy , got pain pills and only had to take 3 of them since surgery, so don’t get afraid. Have it done soon. Get an orthopedic surgeon if near muscles. Good luck to all. I get to shower tonight and removed bandages, but can see under it and stitches and cut area look ok.
hi i’m rajiv and i m also suffering from multiple lipomas all over my body, they are in peanut size and some are smaller than that. ok fine, they are growing in numbers, i have around 40-50.so no one has mentioned their diet may be it happens due to some similer kind of diet. ok i tell u what i usually take, i used to smoke. i started at a very young age, may be when i was at the age of 15, now i m 32. i drink alcohol. and also having a habit of over eating mostily i take vegg diet, som time in a month i take chicken or mutton, i take eggs but not on a regular basis. the only reson i found in many years is alcohol and smoke and the last reason may be overeating and not doing workout (lazy lifestyle). if you find any similarities that plz email me at rajiv2009 [at] hotmail [dot] com. we only can find out the reason beause we only suffering these little b*******. Hi Arinola, good luck with your surgery. The only person who can advise you about your fiancée’s cyst is the surgeon who is doing the procedure. I’m sure the surgeon knows what he is doing, but you should talk to him if you are worried. Hope it all works out. Going in today to have lipoma removed. Doing it in the Doctor’s office. It on the back of the neck area and is maybe the size of a small lemon. Had a CT scan last week. Doc said that it was not deep at all and is confident about removing it. Still the surgery is a 3pm and I am just a little bit scared. Had the lipoma for over 20 years but it is getting a little bigger every year. Thanks for the story above and all the posts. Got back home at 6pm. They have a drain in my neck Occh…. but not a lot pain. Saw the lipoma they removed. I was 6cm X 2cm. They shot me up with pain killers, I cashed for about 6 hours afterwords. Back to Doc today. Hope they will remove the drain (this is the forth day). It’s draining about 12cc a day. Not a lot of pain but I am worried about the swelling. The lipmoa was about 6.5cm long. And maybe that round also. May I ask who did the surgey, a general surgeon or plastic surgeon? I have one on my neck at similar size. I am so afraid about the possible nerve damage. I am in DC area. Any suggestions? Thanks. I have small lump didn’t take notice, my husband even told me to have it check, until I asked a nurse friend to feel it and said I needed this lump to be removed. I checked in the Internet and read about your story, I am thinking of making an appointment to have it seen and check in Monday. Hoping it’s not as bad as cancerous, it feels like a small hard tiny ball in my upper thigh ;( . Let’s wait for the physicians to decide. I recently diagnosed with a large lipoma located intramuscularly in the adductor brevis muscle inside the right thigh. It was found after I was hospitalised with severe abdominal pain located in the groin on top of my thigh and following a CT scan and MRI. I was due to have a cyst the size of a walnut on my shoulder and a lipoma removed from my abdomen a couple of months ago on the same day. The cyst was removed under a local, but the surgeon started having doubts about the lipoma and wanted it scanned by ultrasound. I’ve had that done now and its all fine so I’m due to have the lipoma removed next week under a local which due to its location I’m really not looking forward to.